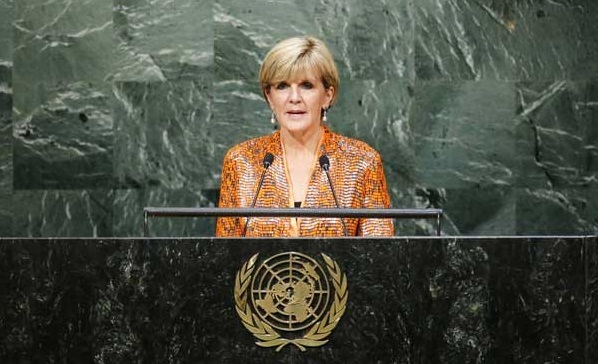 SYDNEY – Australia will bid to rejoin the United Nations Security Council by the end of the next decade, Foreign Minister Julie Bishop said in a statement. Bishop said Australia, whose last two-year term ended in December 2014, would promote greater international cooperation to tackle global security challenges in its bid for a non-permanent 2029-30 seat. Bishop told a forum in New York on countering Islamic State and violent extremism, hosted by US President Barack Obama, that while a comprehensive package of domestic counter-terrorism measures had been put in place, it was important to defeat the group at their source. She told the forum on the sidelines of the annual gathering of world leaders for the UN General Assembly that ISIS efforts in Syria had been blunted by air strikes in recent weeks. The UN Security Council includes 10 non-permanent members, with five elected each year. The 2029-30 seat is the first available that is currently uncontested, giving Australia the greatest chance of success and reducing its costs in bidding. The United States, China, France, Russia, and the United Kingdom make up the five permanent members of the UN Security Council. Australia is also a candidate for the UN Human Rights Council for 2018-20. It is promoting the rights of women and its push for the global abolition of the death penalty in its bid for that seat.